electrophoretic display (EPD) on the market: Lectum®. Plastic Logic offers displays in different sizes, for different applications and use cases. Plastic Logic offers evaluation kits for all displays and display platforms ensuring a quick and easy evaluation of our display technology. Imagine a sandwich without any filler; that’s your basic display. The slice of bread on the bottom is the so-called backplane – usually a matrix of transistors. The slice on top is called the frontplane – the respective display media driven and controlled by the backplane. The majority of displays currently on the market traditionally use a backplane made of silicon on glass. If you want to make a flexible display, however, you need to manufacture a flexible sandwich. 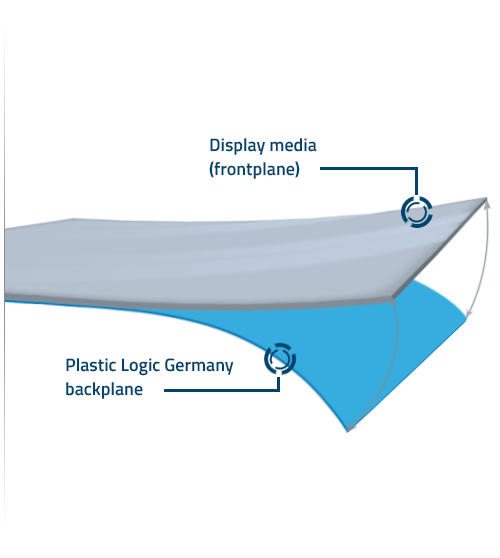 At Plastic Logic, we have successfully industrialized a process which enables us to create a glass-free backplane. We are the first company worldwide able to manufacture transistor arrays (basically a matrix of transistors) on plastic. Instead of using traditional silicon transistors, our active-matrix backplane consists of organic thin film transistors (OTFTs) on PET; that’s exactly the same plastic used to make cola bottles. 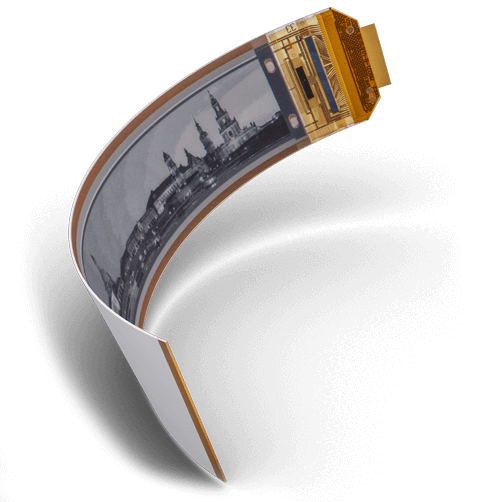 This means that a flexible backplane can now be coupled with a flexible display medium, such as flexible OLED or flexible EPD, to create a fully flexible display. Lectum uses an electrophoretic plastic frontplane and is the first flexible, glass-free display in volume production. These high-resolution displays afford the same reading experience as with paper, including an ultra-wide viewing angle. But being completely made of plastic, Lectum displays are much more rugged than standard glass-based EPDs. They are also thinner and lighter per square inch than their conventional EPD counterparts. And because they are EPDs, they are inherently low-power, which is extremely important in today’s increasingly mobile world. from very small to the current maximum size of around A4. Once you’ve made your sandwich, you might cover it in plastic wrap before putting it in your lunchbox, bag or satchel in order to protect it from drying out or to avoid the addition of unwanted “ingredients”. The same goes for our plastic display sandwich: we use bottom and top layers of encapsulation to protect the display against humidity and ensure a high level of performance quality and reliability. Nevertheless, we are able to manufacture certain displays with a thickness as low as 475µmm. For the first time in history, product designers can now access a production ready, truly flexible display, which can be integrated in a wide range of accessories in varied markets; from smart cards to wearables and mobile devices to signage. End users are already benefitting from innovative products integrating Lectum displays; from smartphone accessories providing a second screen platform to smart jewelry, which instantaneously matches your outfit. Plastic Logic has grouped the displays into three separate display platforms for Lectum displays based on different EPD controllers; all EPD displays require an EPD controller and Lectum displays are no exception. EPD controllers mainly differ in the maximum number of supported pixels and each of our platforms is, therefore, suited to a specific dimension of display. It should be noted that the number of pixels is not only dependent on the active display area but also on the pixel density (ppi). Please select one from the list below according to your requirements, or select custom design if you are interested in a custom specific display solution. Not sure about the display size, or about the display platforms?